Resinall's commitment to resin technology and process engineering is demonstrated in our highly flexible and innovative plant design and layout. Unlike many companies which design their facilities to utilize a particular raw material and/or to produce large volumes of a specific product, Resinall’s plants are extremely versatile. 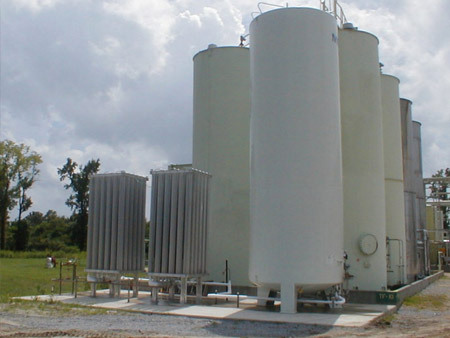 This versatility allows a wide variety of chemical reactions and raw materials enabling us to tailor products to meet the unique requirements of each customer. This same flexibility helps guarantee product availability during periods of raw material shortages or high cost by allowing us to modify or reformulate existing products to alternative resins which better meet customer cost/performance needs. It has also proven valuable to those seeking tolling of a specialty product. Resinall operates two manufacturing facilities in North America, located in Hattiesburg, MS and Severn, NC, and currently has a long term agreement with Umicore Specialty Materials Brugge NV for toll production of products in Europe. Reactors range from pilot to 175,000 LB (79 MT) and are constructed of 304 and 316 Stainless Steel with pressure ratings of 50 to 300 psi at 280°C. Products are produced as solids and in solution form. Packaging for solid products include 50 LB (22.5 KG) bags, drums and bulk bags, while solution products are packaged in drums, totes, tank trucks and railcars. Resinall’s goal is to exceed customer expectation by consistently providing outstanding service, premium product quality and exceptional value in meeting customer needs. ALL Resinall’s facilities are certified to the ISO 9001:2008 standard.